The small village of Farley Hill near Reading) would seem an unlikely place for an audio “Bake off” but on Saturday 21st April this year The Victory Hall, the local community hall hosted an event organised by The Audio Standard, a popular internet audio forum. For those unfamiliar with the concept of the “Bake off”, people come together with various items they want to compare. In this case there were two demonstration areas, a “budget esoterica” room and the main “High End” area. 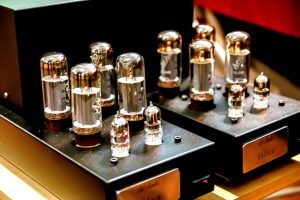 The “High End” system featured the first public outing of the very first pair of the new Art Audio Veloce mono-bloc power amplifiers. These new valve amps use a matched quad of the classic EL34 valves/tubes per channel, wired in a pure class A triode topology. As the name Veloce suggests, they have a fast and accurate delivery, with everything about them there for the purpose of performance. On the day these were driven by an Art Audio VP1 pre amp fed from both digital and analogue sources, including a Garrard 401, rebuilt by Paul Stewart. The main speakers on the day were a pair of classic Gale 401 monitors, this could have been a problem as they are 4 Ohm and are a notoriously difficult load to drive. However the combination of the Veloce’s 4 ohm transformer taps (4 and 8 are standard) and the topology of the amp, mean that they can exert grip and control on many difficult loads, which they certainly did in this case. The owner of the Gal’s said it was the best he had heard them, despite having them driven by a number of classic and high end amps on the day. 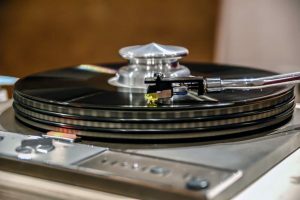 A number of the visitors to the event commented that the best sound on the day was with the Garrard, Art Audio, Gale combination.